If you have ever tried to maintain a lake, you are probably aware that overgrown vegetation can be a nightmare. Weeds have the capacity to expand over the surfaces of lakes and ponds, making bodies of water virtually unusable for swimming, fishing and boating. Additionally, dense weed growth can cause fish to die in large numbers due to oxygen depletion. Therefore, water weed removal is necessary for both recreational and environmental reasons. While tackling lake weeds can be very difficult, there are several lake weed control products to assist in remedying your water weed removal challenges. Although it will take a great deal of time and physical labor, manually removing weeds is one way to clean up a lake or pond. You will first need to cut the weeds or pull them up by hand. Rakes and hoes can then assist you in taking weeds out of the lake. The downside to manual removal is that the weeds are likely to grow back in the future. A more efficient method involves using specialized lake weed control products to target weeds at their roots to extract them more aggressively. Aquatic harvesters are powerful machines that can remove the most obstinate weeds rapidly and effectively. They are similar to lawn mowers except, of course, for the fact that they operate in water. With wirecutting devices and weed collecting capabilities, aquatic harvesters can remove weeds from the lake at very high speeds. While it is still possible that persistent weeds will return, aquatic harvesters will greatly lessen the problem. 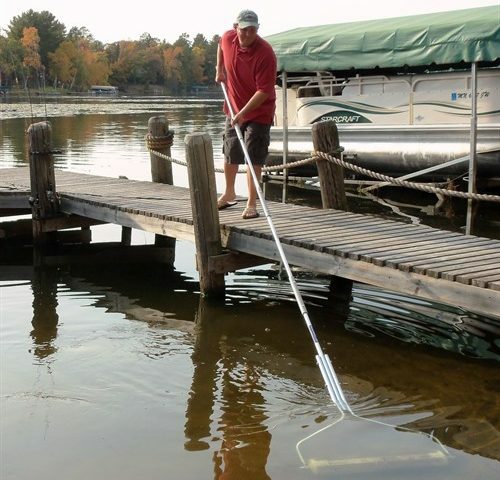 Owning an aquatic harvester is a worthy investment if you need to do a lot of lake maintenance. How Well Do These Machines Work? Aquatic harvesters are not only effective, but they work rapidly. Owning a harvester allows you to remove large areas of weeds from you lake in as little as a few hours. There are many harvesters on the market that do not work well, whether this is a result of size, instability, or lack of function. It is important to take the time to choose a machine that works for you and your lake. When choosing an aquatic harvester, you will need to consider the depth and size of your waterway and where you weeds are concentrated. If your body of water is shallow and small, steer clear of big, bulky machines. If you live in a windy area, look into machines with built in stability. If your lake is very deep, find a machine equipped to handle water depth. Regardless of the nature of your body of water, you will need a harvester with a powerful engine. Water weed removal can be very complex and difficult, but it doesn’t have to be. Lake weed control products such as aquatic harvesters can speed up and simplify the process of weed removal. If you choose the right product, your aquatic vegetation problems are likely to become of thing of the past. By helping to control weed overgrowth, you can improve the environment and create a useable lake once again.